"Revealed Now: The Secret Steps To Finally Creating The Cash Flow You Desire From The Internet"
Why are you trying to make money on the internet? You know it's because you desire more money to buy and do the things you want. Buy financial security for you and your family in the years ahead. Buy recognition and respect from your friends and peers (through being the owner of a nice home, driving a nice car, wearing sharp and attractive clothes, etc). Be able to spend time enjoying yourself, and enjoying the company of your family. No bull stuff. No hype. You've been put through enough of that already...and can find plenty of it all over the place if you haven't. That's how confident I am that the course will work for you. So why not save yourself financial indigestion? 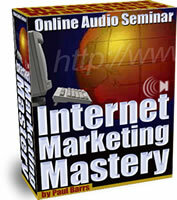 Sacrifice a pizza or some other greasy fast food, and order "Internet Marketing Mastery" now! If you're still not sure about ordering, remember that figuring out a success formula on your own is possible...but it's also a lot of hard work. Why not use a tested and proven system that's ready for you right now, and skip all that hard work and struggle? You can order now by clicking on the link below. You'll be taken to a payment page that's 100% secure. You'll get instant access to the course when your payment is received.